After all that football, it got around to Sunday, and I sat down to do what has become normal routine for me on the weekends -- first reviewing the coupons/sales at the stores, and then planning out my weekly menu based on that and what recipes I am in the mood for. Ironic side note: I posted about menu-planning almost exactly one year ago. It must be the cool weather, shorter days and upcoming holiday season that makes me rethink my weekly dinner strategy! Menu-planning really pays off bigtime for me, in both time and money -- I can usually save about $15-20 on groceries with coupons and sales. The best weeks are when I don't have to go to the store any other times during the week, and we can come home to a stocked fridge with a few different meals to choose from. This week, I am shooting for similar success. Here's my menu-plan for the week. Right now I am all about Fall and coziness and comfort foods, but I am trying to keep it quasi-healthy at the same time. This menu will also let us chill out after work, without having to cook up a storm. 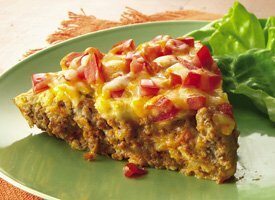 * Taco Pie -- the taco fixings are on sale at Publix this week with their recipe for Taco Nacho Rice, so I stocked up on cheese, ground chuck, tomatoes and shreds for this family favorite. I use crescent rolls to layer out the beef and cheese, but here's another version of the recipe from Betty Crocker (picture credit) that sounds delicious. * Teryaki Pineapple Turkey Burgers with sweet potato fries -- this recipe is a quick fix by using frozen Jennie-O burgers instead of making them from scratch. I will roast up the "fries" in the oven. * Pasta with asparagus tips and sauce -- gotta love an easy night with little to no "cooking" actually required :) We picked up a fun-shaped Archer Farms bag of pasta from Target that will jazz up this weeknight basic. What does your menu look like for the week? Stay tuned! Later this week, I am going to take you inside my recipe binder (and all it's chaos, as you will see) and share with you some of my go-to healthy meal favorites. Happy Menu Planning!